The LaCie 324 LCD monitor is a 24-inch display targeted at creative pros who demand a large color gamut and color accuracy; but with two HDMI inputs for consumer entertainment electronics and support for picture-in-picture technology, the monitor aims to be both a multimedia display and art director’s tool. The 324 succeeds on both fronts. The display setup was simple; the 324 comes fully assembled with one DVI port, and when we connected it to our Mac Pro using the included DVI cable, the display was recognized correctly and displayed its native 1,920-by-1,200-pixel resolution automatically. The first thing I noticed was how bright the display looked—a testament to its luminance, which is measured at 400 cd/m2, and its high contrast ratio, with blacks looking black instead of deep gray. 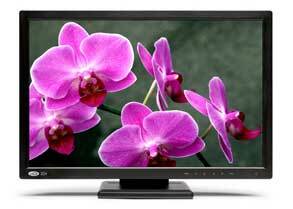 When looking at the 324 with a full black image onscreen, there was very little light leakage, which can occur on some monitors, especially at the edges and corners of the screen. The 324’s viewing angle is excellent. I barely noticed a difference in color or contrast when looking at the display from the side, nearly 90 degrees off angle. With its two HDMI ports, the LaCie 324 can also be used as part of your home entertainment center. Though the colors weren’t too far off with the straight-out-of-the-box default settings, the display did benefit from calibration. We used a Gretag Macbeth Eye-One calibrator, though LaCie does offer a more expensive 324 bundle ($1,240) that includes its own blue eye pro hardware calibration system and software. After calibration, the display performed very well, with accurate colors, good shadow detail, rich blacks, and neutral grays. Text was very legible, even at small point sizes. The only thing I didn’t really love about the display was its menu system, which LaCie calls a “touch sensitive control panel” in the 324’s press release. White navigation icons grace the lower right side of the 324—there are no physical buttons. You simply put your finger on the icons to maneuver around the menu system. I experienced a bit of delay when hitting the “buttons,” sometimes needing to touch them a couple of times. Plus, the lack of physical buttons means that you need to take your eyes off of the menu in order to see where you’re pressing, as there is no tactile clue as to where to push. The on-screen menu offers quite a few tools for display adjustment and preset options, but it’s not your father’s LCD settings menu. With its large black window and white text, the menu took some getting used to, and I imagine that its uniqueness could turn off some. However, after spending some time using it, the apprehension went away and I found it to be very usable. I didn’t do a lot of testing with the HDMI ports, but I did connect the monitor to an Apple TV and can confirm that they do indeed work. I also played some fast-moving 3-D games and DVD scenes to see if the monitor’s response time could keep up with the action and I saw no issues. A large desktop display precise enough for a color professional but flexible enough to connect to a large variety of home entertainment devices, the LaCie 324 has the right tools for both work and pleasure.